Soak tamarind in little water and extract thick juice or use tamarind paste. Wash the banana pieces well and take out from water and put it in a broad vessel. Add salt, turmeric and sambar powder and tamarind extract. Sprinkle little water and mix well. Keep aside for ten to fifteen minutes. In a kadai put the oil and when it is hot, add the banana pieces and stir well. Separate each piece and cover with lid. Cook on low flame for five to ten minutes stirring (actually you have to turn the pieces gently) now and then. Remove the lid and turn the banana pieces and keep it on low flame on stove till it is dry and crispy. This looks a great recipe. Need to try it. and a plate a appadiye kodunga.. want to have it all. Thank you for your comments. It will go well with Rasam Sadam. Please try and post your comments. 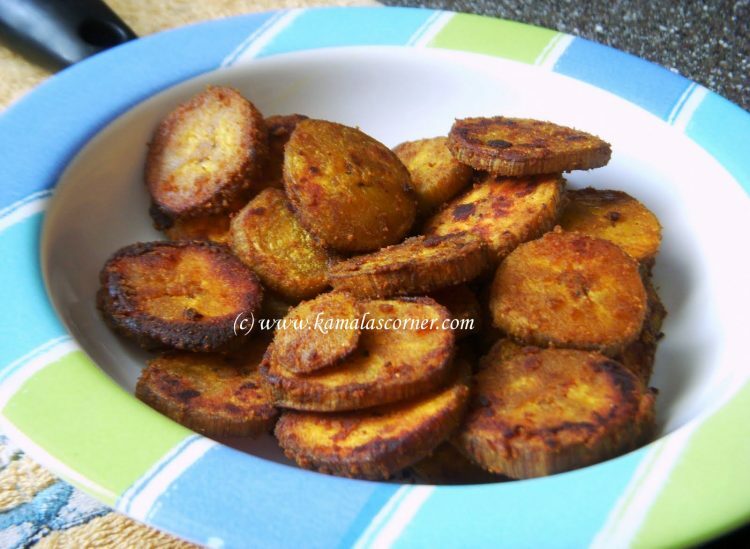 It looks delicious and my wife and I are going to try it the next time we get a plantain. BTW, the pictures are really beautiful make one feel like cooking the dish. Have you tried to write a south indian vegetarian cookbook? Look forward to more postings from you. Thank you for visiting my site and your comments. I have visited your site and it is very informative. Will read it fully when time permits. i've tried this. excellent taste. Thank you Susila for visiting my blog and your feedback. I am new to this blog. I was looking for sambar powder which can be made at home. I cant find it. If you upload the sambar powder and rasam powder, i would really appreciate it. It will be a useful recipe for many of us who dont know how to prepare sambar powder. BTW, is there anything called vatha kulambu podi? pls explain. I tried this yesterday. It was very good. My husband liked it. Your blog looks neat, easy to pick and a set of most commoy prepared dishes. The tips you gove for some recipies are good. Thanks. Nice to hear that you tried this recipe and it was good. Thank you for your kind feed back on the website.